Well from owning a surf school and being on the beach for 12 hours a day I can safely say that there has been a summer and it was glorious. I think in Northern Ireland we should take summer as a time of long days, moderate temperature and a lot to do. We really aren’t close enough to the equator to be depending on sun every day to make our past times enjoyable. As I sit and write this I try and figure out why people complain about the weather so much. My conclusion is that when you look outside from a warm sheltered house it can sometimes look quite miserable, especially if it is raining. But what I find is that if you spend the majority of your day outside, the rain really doesn’t affect you, maybe that’s because I’m in a wetsuit but usually that rain just passes over and you end up with a few hours of lovely weather. But it also comes down to the individual. I see people every day that come down and use the beach for walking or swimming no matter what the weather is and then there are people who only come down when the sun shines. The important thing is that they are out and about and enjoying a stretch of beach which is beautiful and free to use. At Long Line Surf School we tried to encourage a beach lifestyle the minute we opened. The best way we found how to encourage this was mainly through the children as they don’t care as much about the weather. For the kids there were school trips down to the beach to come surfing which was amazing. To see all those children excited to be given the freedom to just run into the water and to experience it all for themselves. During the school term we also had our own Board Riders Club which consisted of 3 primary schools from Limavady as well as one secondary school. This small bunch of keen surfers came down after school once a week and had a great time while progressing their skills of surfing. Once the Summer Holidays had begun we started our KIDS BIG DAY OUT programme which occurred every Friday from 10am -5:30pm. This really showed off the outdoor lifestyle with the kids being outdoors the entire time with surfing in the morning, lunch in the picnic area even with torrential rain and then beach games followed with a swim in the sea to finish. This became a very popular day at Benone with Kids coming back every week. As well as big days out and normal surf lessons we also ran a number of events to get people to come down and experience Benone Beach in a different way. 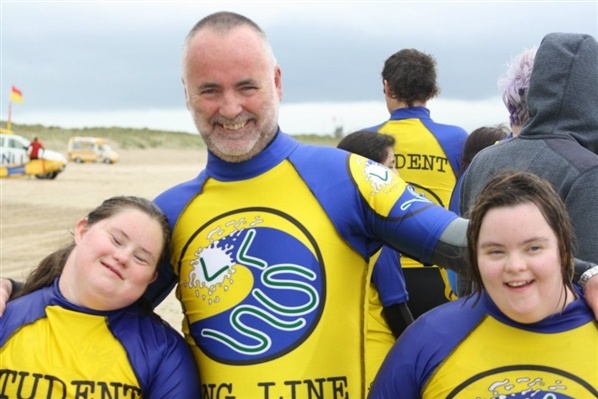 On the 9th June we ran Irelands first Surfing Disabled Festival for young people aged 8-25 with disabilities. This was a great day for all as usually you find that it would be the siblings of the disabled people who would be going and trying these great outdoor sports and so we created the event in order to get everyone involved and with a team of lifeguards and surf instructors we made this day a complete success and a date that will be kept in the diary for next year. In June we also ran the ‘North Coast Annual Waterman Championships’ which consisted of lifeguards, swimmers and members of Triathlon clubs coming down to enter in an endurance event of run, swim, paddle and run. Seeing a lot of adults having a go at this who may have never considered entering anything like this before was great and especially as you finish the trial with your friends and family cheering you on. As July set in, the campsites filled up, the lifeguards started duty, everyone was in full swing and Long Line Surf School became very busy and over the two months to follow we met some great people, made some new friends and even squeezed in a few BBQ’s in between. That is what summer is about, long days with good surf, warm waters and friends learning new skills and giving anything a go. Talking about giving anything a go we were given the most amazing opportunity to run a Blind Surf Session during the summer with a number of members from the guide dogs for the Blind NI. 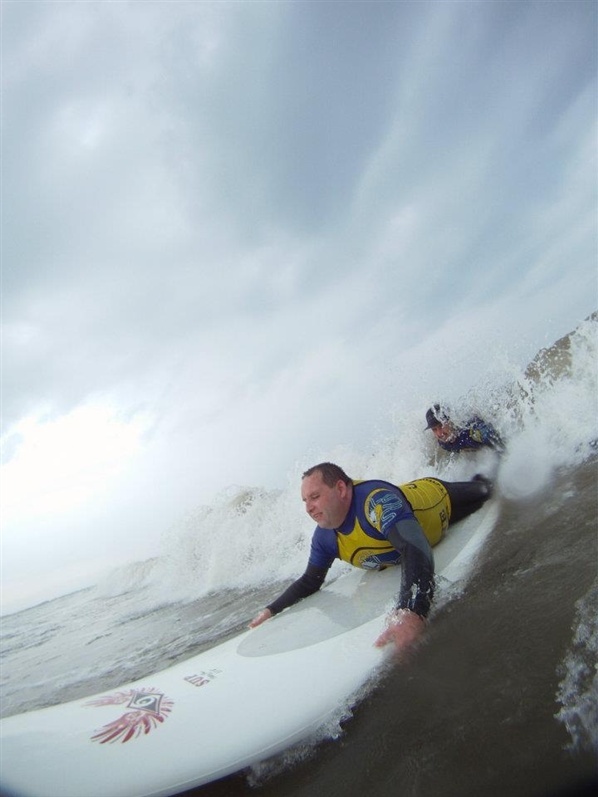 By using our custom made surfboards for people with disabilities we were able to get people with visual impairments on surfboards and instructors on the back of the board in order to help steer the board and keep it balanced. It turned out to be one of the best days of my career as a Surf instructor and something which I found very rewarding. We’ve even got the local surfing community to raise money for the charity in early September at the special surf contest which also consisted of a blind category where the competitors were given blacked out goggles to try and surf with in order to create awareness on how difficult and sometimes intimidating it can be. Now that the Summer on Benone Beach is over, the crowds are starting to leave and the local people still walk the beaches I can now look back and really appreciate this SUMMER no matter what the weather was like. The beach is there for communities and friends to come together and enjoy nature whether it is having a BBQ, surfing, swimming or just grabbing an ice-cream and sitting in your car watching the beach lifestyle unwrap. 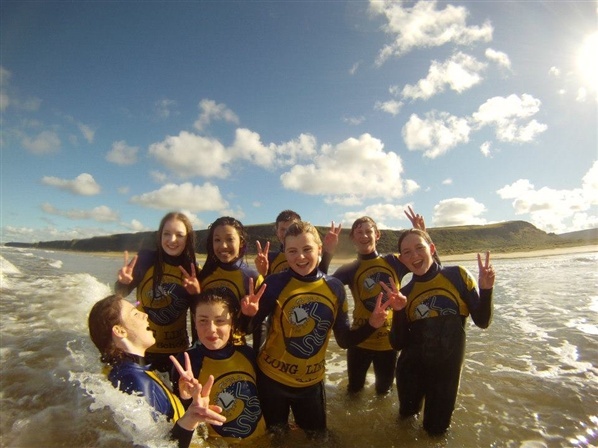 At Long Line Surf School we find that Benone is there to be enjoyed all year round as well as the other beaches on the North Coast and we are very happy to be part of it. Keep an eye out next year for all the events you can become part of. For more information on Long Line Surf School and what they offer at Benone Beach please visit their profile on OutdoorNI.com. 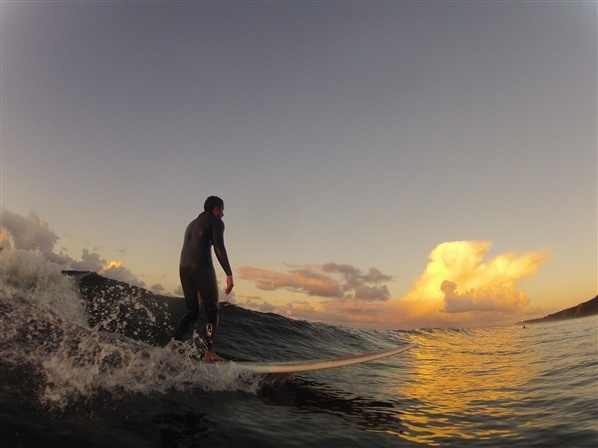 Dan is the founder and owner of Long Line Surf School and was previously Junior Irish Longboard Champion. He is young but very knowledgeable in the sport and has been a surf coach for many years now as well as being a beach lifeguard on the North Coast for 3 years. 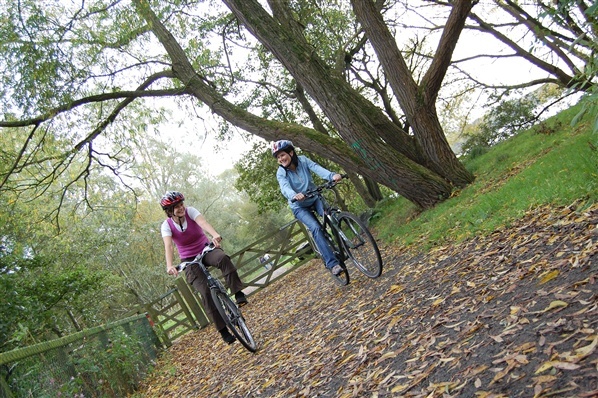 A measly one in ten women cycle more than once a month, according to Sustrans. However, with cycling more popular than ever, it’s great to see more girls getting into gear and ladies layering up on the roads, cycle paths, mountains and wherever else! Our ten helpful tips will show you how to get the most out of your trusty two-wheeled friend, what to wear and where to go. Over the last few months, we’ve seen Sarah Storey win three Paralympic gold medals, Laura Trott win two Olympic golds and Victoria Pendleton bow out gracefully from her professional cycling career (and not so gracefully onto the dance floor of Strictly but that’s another story). Laura Trott took up cycling alongside her mother, who went on to lose 5 stone, which is inspiration in itself! It just goes to show that women are every bit as competitive and successful as men when it comes to cycling, and not just at road and track events – Shanaze Reade and Annie Last are flying the flag for BMX and mountain biking respectively. Let’s face it, who doesn’t like a bit of shopping here and there? The ability to research, negotiate and grab a bargain can all come into play when you’re shopping for bikes and cycling equipment. If you’re a bit cautious about visiting a bike shop, going armed with a bit of background knowledge and lots of questions is a good approach. Also, there’s a wealth of accessories and clothing to choose from out there – heaven. The list of cycling benefits is endless. You’ll get fresh air, exposure to sunlight and lots of exercise, resulting in a better mood, improved sleep and a more toned physique. As a guide, even a gentle cycle for an hour will burn around 500 calories and is much cheaper and easier than a visit to the gym! Tired of sitting in traffic for a good portion of your morning? Why not cycle to work instead? It’s a great way to multitask and you’ll save money on petrol and parking too. Of course, it’s fine to hop in the car if the skies are looking a bit treacherous, but even a jaunt to work on your bike once a week will make a difference. No showers at work? The festival favourite of baby wipes is an easy solution to freshening up, as is a change of clothes kept in a locker/drawer. However, if you allow a little more time for a slower amble in for the morning, you won’t get too sweaty and you can then go faster on the way home. If you’re new to cycling, a good way to keep up your motivation is to train for a local race, or if you’ve got a bit more experience, why not see how your hard work will pay off putting your skills to the test? Check out the CycleNi events page for future rides, or why not organise your own to raise money for charity? If you’re buying a new bike, any good bike shop will help you ensure that the bike is a good fit for you. Even a small tweak here and there like altering your seatpost or handlebars might make a world of difference. Some other things to try are a different saddle (gel ones are good) for a comfortable ride, or try a pair of padded cycling shorts to be kind to your behind. Not in a flowery, pastel fashion – bikes and accessories for women have come a long way since the ‘pink it and shrink it’ mentality of the last few decades. Bike companies are now producing stylish bikes with all the performance features of men’s bikes but with women-specific geometry. Likewise, cycle clothing designers are shying away from more feminine colour schemes and are producing some really nice looking items, especially Altura and Endura. Not in terms of a trip to the hairdressers for some extra volume, the key to a good cycling expedition is a good layering system. It’s much easier to finely tune a variety of layers than a couple which make you too hot or cold. A baselayer goes first, followed by a midlayer and then an outer shell (jacket). Gloves are always handy (no pun intended) for extra warmth. If you have children, it’s great to involve them in cycling too. For tinier offspring, childseats and trailers are fantastic options, or tag-alongs for slightly older children. Then there’s a wide range of children’s bikes which are guaranteed to keep them occupied for hours on end. Also, there’s nothing better than passing on the skill of cycling to someone, especially when it’s a member of your family. The world is your oyster when it comes to cycling (motorways and ‘no cycling’ signs permitted!) and cycle apps are great for discovering cycle route options. 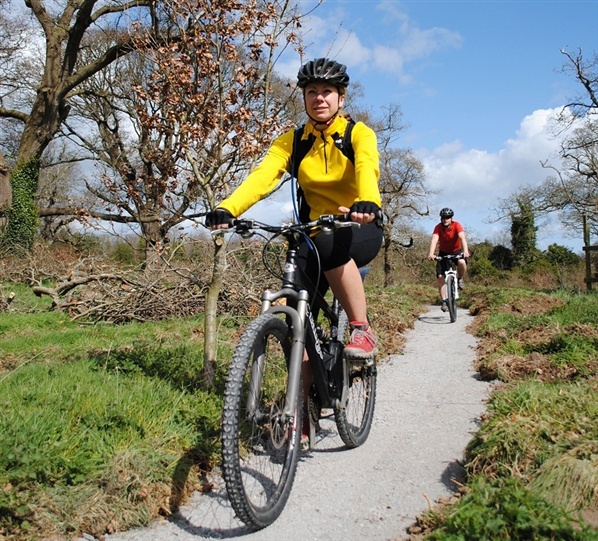 There are plenty of traffic free paths in Northern Ireland to start cycling on to build up your confidence before you venture either out onto the road or onto more technical off road trails. A few recommendations are the Lagan and Lough Towpath and the Newry Canal Towpath, as well as the various purpose built family cycling trails at Castle Archdale, Gosford Forest Park, Castlewellan Forest Park, Castle Ward Demesne, Craigavon Lakes and Blessingbourne Estate. Tredz Bikes stock anything and everything to do with bikes, offering friendly advice, great customer service and free UK delivery. Follow their blog, like them on Facebook or follow them on Twitter. Sally is a copywriter for Tredz Bikes and is based in South Wales. She is originally from Birmingham but has been enjoying living near the fantastic beaches and countryside of South Wales for 8 years. She plays in the Swansea Netball League and keeps backache at bay with Pilates. Sally loves getting out on her bike accompanied by her toddler Arthur on the back! Check out our favourite family outdoor activity ideas for this Halloween! Enjoy all the chills and thrills with a host of terror-ific Halloween themed activities and character performances. Experience hair raising story telling, spooky sound effects, flashing lights and a liberal covering of spider’s webs and creeping fog in this truly haunting experience at Barnett’s Demesne. Don’t forget to come dressed to thrill! Booking essential. With pumpkin carving, ghost stories, face painting and ghoulish treats this really is the ultimate Halloween party. For those looking for more chills and thrills head down the haunted forest trail, take part in the pumpkin paddle or climb aboard the ghost ship and watch as fireworks light up the sky. Let your little terrors get into the Halloween spirit with some multi-activity madness. Drop them off for a day (or week!) of fun adventure activities including abseiling, canoeing, archery, team challenges and much more…. It’s time to face your fears…fright nights at the Jungle are back and they are bigger, better and even more frightening than before! Many special effects will help set the mood on this terrifying tour through the haunted woods with only a lantern to guide the way. Suitable for adults and children aged 12 years plus. Carrowmena Activity Centre welcome you to their ‘field of screams!’ Try not to get lost in the darkness as you navigate your way around the errie maize maze - once you’ve entered there’s no turning back…There will be ‘trick or treat’ prizes, music and a campfire waiting for those who make it back alive! Don’t miss the last opportunity this year to experience the exhilarating whirlpools on board Strangford Sea Safari's high speed boat! 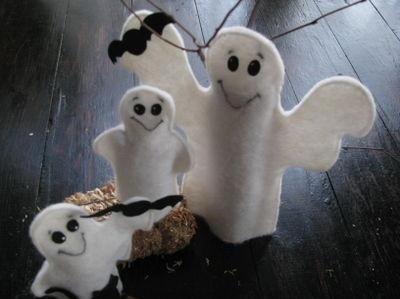 As well as visitng all the usual sights including the Angus Rocks Lighthouse, Sea Gen and some of the many seals at Cloughy Rocks this spooky edition will feature some scary history about the lough and Halloween treats for the kids! Whatever you decide to do make it a scary one - Happy Halloween! I had the great privilege and pleasure of hosting Christopher and Jane Somerville on Rathlin Island thanks to a request from Outdoor Recreation Northern Ireland. Christopher and Jane were delightful companions and I learned a lot from them. They are experts on birds, plants and nature in general and are very interested in Irish culture, music and literature – this led to great conversations and even a duet by Chris and myself on a Paul Brady song – Nothing but the same old story!! We spent the day on Rathlin strolling to Rue Point and taking in the Roonivoolin walk developed by the RSPB. It was a dream walk – peaceful and intense in its beauty. We were accompanied by stonechats and watched by hares. We passed several lakes including Ushet Lough where ‘model yacht racing’ regularly takes place. 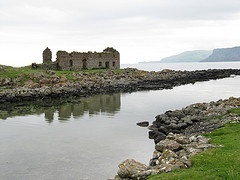 We picnicked at a roofless kelp store – wonderful stone building – and thought of all the work that had taken place there and the people involved – now so empty and quiet. Oh it wasn’t so quiet – seals were sitting on the rocks and one seemed to be complaining about something according to its moans. We encountered a ‘winged cow’ on Roonivoolin on our way back and couldn’t come up with any good explanation for this strange apparition. We saw more seals in Mill Bay on our way back to the harbour to get our ferry. We stopped in at the boathouse museum and said hello to Tom McDonnell, an award winning nature photographer, who has produced great pictures and postcards of the wildlife on Rathlin. Contentedly we returned to Ballycastle on Canna, a ship that had been in use in the Scottish islands and which Chris had been on 25 years before! – somehow it completed a perfect day. Click here for route descriptions and detailed maps of Quality Walks on Rathlin Island. Sean runs Walk Talk Ireland www.walktalkireland.com bringing walkers to the Glens of Antrim and the Causeway Coast and then on to Donegal.